Yoga teacher training in a place like Dharamsala is almost like a direct gift from the Divine to mankind. 500 hour yoga teacher training in Dharamsala that we provide in Rishikesh Yog Mandir provides a chance for the intermediate and advanced yogis and yoga practitioners to take their practice to another level altogether. For the people who happen to visit India for the first time will get the chance to avail this amazing opportunity of being in the midst of the amazing snow-capped mountains and serene weather along with delving deep into the peace and joyfulness of practicing and learning yoga. 500 hour yoga teacher training in Dharamsala India will help in developing the inners self as well as the physical appearance of any individual. This advanced course has its objectives regarding the expansion of the quality, receptiveness, love, self-discipline, focus, and freedom from any kind of negativity that an individual has in him. 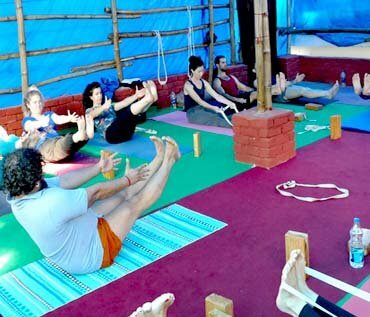 Yoga teacher training in Dharamsala with the experienced faculties that Rishikesh Yog Mandir will be one of the most memorable periods of your life that will have a transforming effect on your overall lifestyle and way of living. The students who undergo our 500 yoga teacher training course find themselves having a clear vision of their life path and have enhanced concentration. Even before they complete the entire yoga class, they will find themselves to have evolved drastically. Students will get the basic knowledge and clear concepts regarding the fundamental concepts of the yoga aspects which will help them in getting the core insights of the ancient art of health and science. After gaining mastery over the fundamental concepts of yoga and other aspects of yoga, they shall be taught regarding the advanced levels and modifications of the yoga asanas. After the completion of the course, the students shall be receiving a certificate from the institute which is one of the renowned yoga schools in the world. The students those who get the certification of having 500 hour yoga course in Dharamsala, they shall be able to teach other students the intricate practice of yoga in a much better and professional way. They will also be able to teach others in a more effective way and trace their oath of yoga training which will uplift their own lives. Our course for 200, 300 and 500 hour yoga teacher training India includes the chanting and mantras. There is the continuous practice of kriyas involved in our course which is done both in the theoretical and practical manner. The contradictions, as well as benefits of the kriyas, are being taught to the students with practical and technical tips. In yoga ttc in Dharamsala, we provide the lessons in a very diligent manner. In spite of the arduous structure of the advanced course, we provide breaks to our students for enjoying their free time along with some outings. We provide basic knowledge of yoga that encompasses the Hatha yoga to our students. In our yoga center in Dharamsala, our experienced faculties focus on the postures, bandha, drishti, the pronunciation of the words in Sanskrit, roots as well as the definition of every asana in yoga. The teachers that provide training to the students are very well qualified and certified in yoga training which makes our yoga school to provide the best 500 hour advanced yoga teacher training in Dharamsala. Completely vegetarian, began and satvik food from which students can make their choices.